Here is the finished rig – on the floor in my shop. I had wanted to photograph them afloat in natural light – but the weather did not cooperate and I wanted to get them back to their rightful owner post haste. I will finish gunning decoys in either oils or acrylics but I usually use the latter. Acrylic latex house paint is easy to use because it thins and cleans up with water and because it is inexpensive, available in almost any color, and comes in small containers. I use Behr paints from Home Depot. They are dead flat, cover well and available in 8-ounce sample jars. So, I don’t mind buying even “odd” colors – as for bills and speculums – because at $3 or $4 per jar, it’s quite reasonable. On the other hand, because these are acrylics, I can always just use some tube acrylics for the smaller accents. Here are (most of) the colors I used for these Gadwalls. 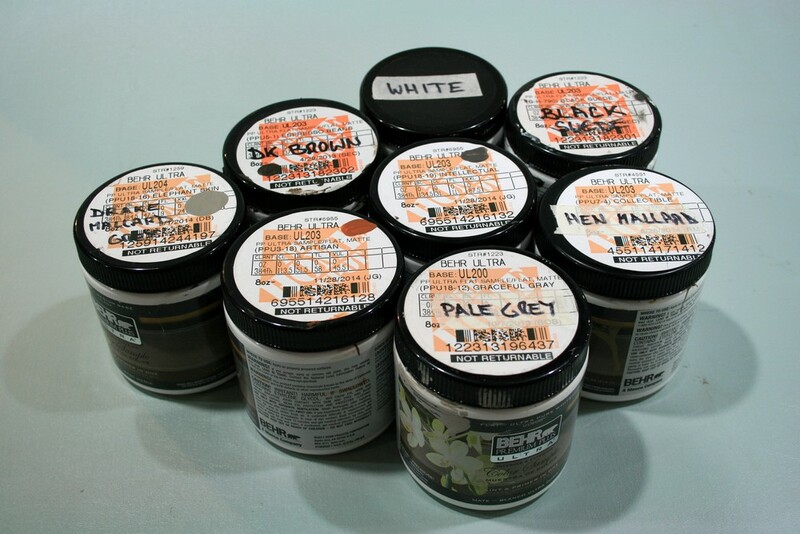 If you paint many different species, you will find that some colors can be used on more than one species – and some – like Black and White, of course – on most. On the other hand, it is worth being a bit fussy and parsing out the subtle differences among hues. For example, here are three different Greys I used in the Drakes – Graceful Grey, Elephant Skin and Intellectual. Each has its own “personality” and use – but are also used on Mallards, Broadbill, Canvasback, Whistlers, Woodies, Teal, et cetera. 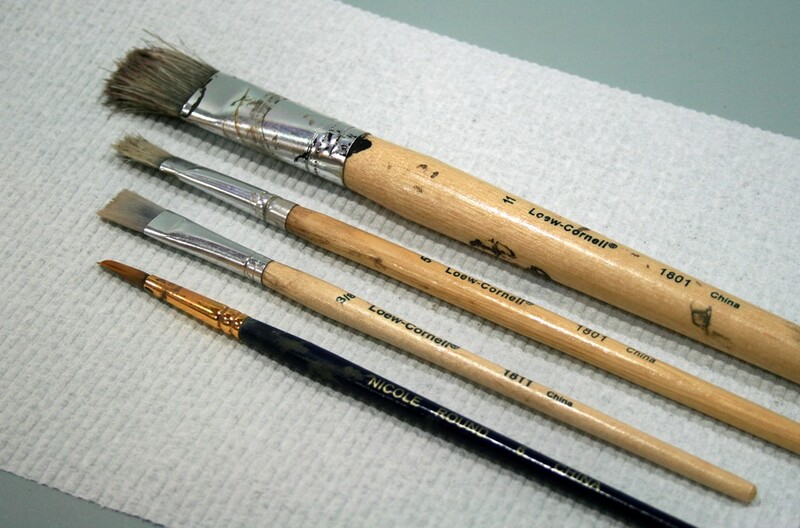 I use just a few brushes – nothing fancy. I like the square-edged “flats” because I can push paint around as well as pull it. And – probably most important – flats are great for stippling, especially when they are a bit shopworn. 1 – Here is the tail section – the Grey Tertials curve downward and are a key feature – put in with Elephant Skin. The tail feathers are Collectible. 2 – The sides are stippled over the Black primer – mostly with Elephant Skin but also with the paler Graceful Grey on the flanks. 3 – The tertials are overlapped by the reddish scapulars – which are Artisan overpainted with Collectible – the Hen Mallard base color..
4 – The cape is stippled with the pale Graceful Grey. 5 – The breast is stippled with the paler Grey then stippled again with Black to get the right tone – darker than the sides but not pure Black. 6 – The head is painted with Collectible – then upper half of the face and head are darkened with Fedora. The gape of the bill is a pale Orange. 7 – Here is a completed Drake – ready to hunt. 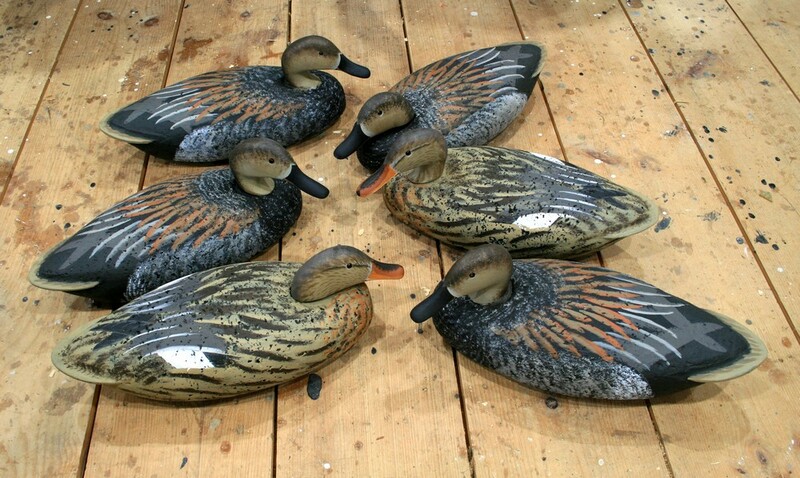 1 – The tail section is Collectible – the Hen Mallard base color streaked with a Dark Brown. The Graceful Grey tertials curve downward as in the drake. 2 – The sides are streaked – flowing upward toward the stern – with Dark Brown over Hen Mallard base. 3 – I show the White speculum on the hens – but could have put it on the drakes as well. 4 – The breast is warmed up a bit with some reddish Artisan. 5 – I used 3 oranges on these bills – but one would do. The saddle is not as large as in a hen Mallard. 6 – This looks a lot like a hen Mallard because – just like the drakes – the Gadwall’s steep crown is missing from the carving. 7 – Ready to hunt! What orange do you use for the bills? Thanks for the excellent tutorials!